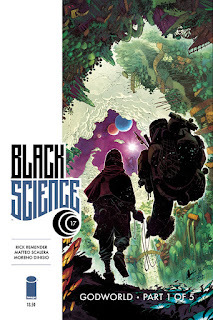 Bestselling writer Rick Remender (LOW, DEADLY CLASS, TOKYO GHOST), artist Matteo Scalera (DYNAMO FIVE, Deadpool), and colorist Moreno Denisio will launch a new story arc in their eminently compelling sci-fi series BLACK SCIENCE this November. Previously in BLACK SCIENCE, the use of The Pillar has allowed Anarchist scientist Grant McKay to travel to any possible universe. His was never a safe endeavor. The Anarchist League of Scientists has come to harbor two goals: clean up the Eververse and get home. In BLACK SCIENCE #17, a bold new era begins. New readers are invited to join the Dimensionauts in a psychedelic journey of the soul. BLACK SCIENCE #17 hits stores Wednesday, November 4th.